Having extreme hunger or extreme cravings or uncontrollable binging sessions is not a healthy relationship with food and is often a sign that something is wrong. Binge eating (or bulimia – where you also compensate for the binging) is actually a lot more common than people realise, and it is an eating disorder that many can keep secret for years. Infact it is believed that the statistics are lower than in reality because so many people keep their illness a secret and don’t seek help for fear of embarrassement. Often it is not an eating disorder that people can see from the outside, i.e such as when someone loses a lot of weight due to anorexia. People with binge eating disorder can be a normal weight and keep their illness secret for years – a lot longer than other eating disorders. Having cravings and over eating is not the same as binging and having unctronllable eating sessions. Are you sleeping enough and drinking enough water? Are you eating enough calories and eating regular meal times? Are your hormones in check/balance…? Do you have a healthy body fat percentage? Do you feel satisfied after eating a meal or do you still feel hungry/have cravings? If you are feeling extremely hungry my recommendation is to eat…. We are brainwashed with eating mini portions and eating “diet food”. Thinking that we can only eat according to portion sizes… but you know what, your body often knows better than generic portion sizes and recommendations. They are just guidelines, and not something you have to follow. Eat the amount that YOU need. Eat an extra snack, take that extra portion of food, eat 8 meals in a day if you feel that that is what your body is calling after. It can be scary, especially if you are used to only eating a few times a day or eating mini portions. But listen to your body… that is key. It can be scary to listen to your body when it is constantly hungry and you feel like you could just keep eating non stop. But there is often a reason for that feeling, and the best thing is to just eat what your body is calling after. And remember to NOT restrict if you do eat more – that will just end up in a binge-restrict cycle. Try to eat regular meal times and eat until full/satisfied, and then eat again when you are hungry even if that means 30 minutes later. You might just need a few days of eating more (yup, you can end up eating several thousand calories and THAT IS OK.) for your body to calm down. It may be due to hormones, stress or too low body fat. (Too low body fat can impact your hormones and make you feel extra hungry.) Also if you have been on a restrcitve diet – even just a short time can make your hormones go wild and make you feel extra hungry. If your body has been restricted from calories or certain macronutrients it deprives your body and then signals kick in to “store food and want all the food” in preperation for starvation/times with little food. And to regulate your hormones and signals you need to eat more, give your body all the nutrients and energy it needs, not stress or feel guilty. But also having a healthy body fat percentage and healthy hormone balance are two factors that regular hunger and cravings. 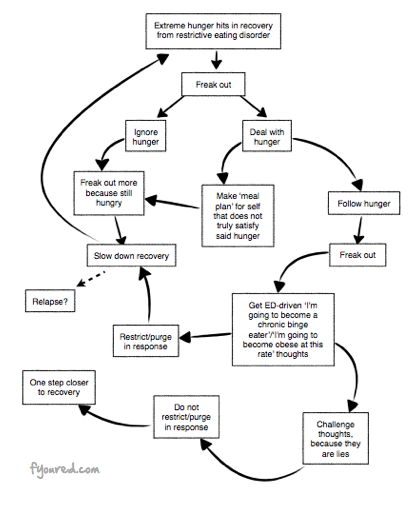 If you are in recovery from an eating disorder, extreme hunger can last several weeks. And if it is due to stress or hormones, then you need to fix the actual problem – but also eating more can help the cravings and hunger. It may just be that you have been undereating unintentiontinally, or maybe you are too active and don’t eat enough. Or maybe you just need more carbs or more fats and you haven’t been eating enough of those macronutrients. I hope this helps anyone who has extreme hunger. Just remember that extreme hunger which lasts for more than several days as well as extreme cravings are often a sign/symptom of something. Also note, this is just advice and i would recommend going to a doctor, dietitan or a therapist if the extreme hunger continues for a long time. If you are eating enough and eating balanced then there shouldn’t be any extreme cravings, binging or extreme hunger. Remember, the body is smart. If there is problems or unbalance in your body it will show symptoms and send signals to try to repair the problem. Listen to your body! I totally agree with you where you say to listen to your body – even though it is hard to do that at first. My appetite varies from day to day and it has taken a while for me to learn to trust my bodies signals where feeling hungry or not so hungry is concerned – especially since coming off my meal plan. But the body is extremely clever and lets you know what it needs, so learning to trust it is key.